EC-Council as a world leader in IT Security Certification recently held an exclusive seminar in four universities in Indonesia. The seminar was held continuously at 4 different universities such as Universitas Mercu Buana, Universitas Bina Nusantara, Universitas Multimedia Nusantara, and Universitas Surabaya. Universitas Mercu Buana becomes our first home of seminar. Held at their lovely auditorium attended by more than 400 IT students and was very keen and enthusiasm to listen the sharing knowledge from Vice President of EC-Council, Mr. Sean Lim and one of Certified EC-Council Instructor Mr. Kristian Oktavianus with more than 20 years experience in IT. The Big Step has made by Universitas Mercu Buana as they strengthen the partnership with EC-Council as Academic Partner and joined among 500 universities globally all around the world that deliver IT security qualification in their curriculum and prepare their students to have a chance get high paying job in industry globally. Mr. Arisetyanto Nugroho as Rector of Universitas Mercu Buana and Mr. Bambang Hariyanto as Dean of Faculty of Information Technology Universitas Mercu Buana says ‘ IT Security is the pathway for the students graduate to get high paying jobs globally, partnership with EC-Council will be strengthen their knowledge and proven to the industry that their graduate are qualified. Universitas Bina Nusantara Jakarta in association with HIMSISINFO and Faculty of Computer Science organized the exclusive seminar for our next home. 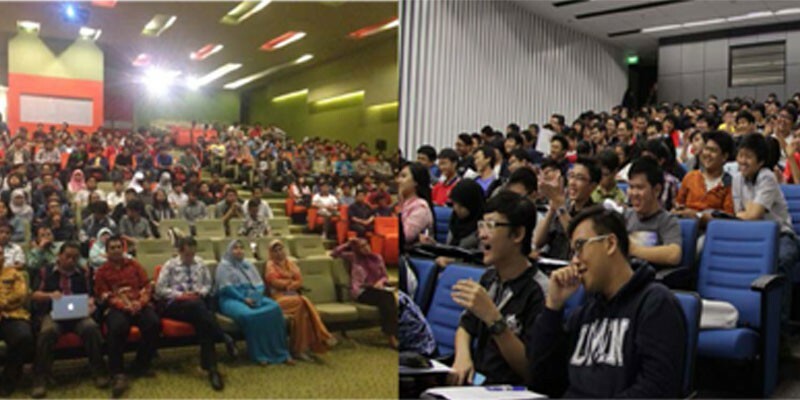 More than 400 IT students attended the seminar from 2 different faculties, Faculty of Information Systems Management and Computer Science. Their student looks enthusiasm to listen and give a lot of questions how they started to learn in IT security. They have admitted that this kind of seminar should be held more intensively, because IT student is eager to learn and know further about the IT Security knowledge applied in industries. Most of students are having a vision to get a job globally. And they realize that they need to have a uniqueness of their qualification to compete with foreign graduates. At last, University of Surabaya another EC-Council’s exclusive seminar was held at Surabaya city. Tin Tin Hadijanto as EC-Council Indonesia Country Manager has brought a point of view on building a career advantage in IT Security. TheThis seminar bring next level of mindset of how IT Security becoming a unique qualification and could bring great impact for real-world IT business and chances for high-paying job is not just a dream for their students. The key message from Miss Lisana as Member of faculty of Universitas Surabaya, ‘ Students needs additional knowledge in practical and focus profession, make them different from others 30.000 graduates every year. It was an honor for EC-Council to help education sector to build strong knowledge for their students, to help the graduate getting unique qualification, unique job in unique industries world wide. EC-Council will continue to carry out similar activities in some future event with other universites in Indonesia. IT Security has become one of the most demand skill globally and becoming an important point in the joints of modern business life as a cog in a role behind the IT continuity at each institution. This exclusive seminar become one of our main agenda in 2014 for only selected Indonesia universities. Are you one of them that ready to become our part of world-wide recognized unique qualifications university in IT security?